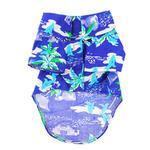 Make waves this season in the designer Hawaiian Camp Shirt with Ocean Blue and Palms! This collared shirt has an allover ocean and palm scene with tailored sleeves. Thanks to the 100% cotton lightweight material, this breezy woven cotton shirt will keep your pup feeling and looking cool during walks on the beach, at pool parties, and on vacation. Hawaiian Camp Shirt by Doggie Design - Ocean Blue and Palms Customer Photos - Send us your photo! Waffles is one true blue Aussie pup. He loves to have fun, play in the sprinkler and snuggle up with his best friend Maple Syrup. Brutus doesn't want summer to end! Callum is your typical terrier. He loves to dig and chase his cat siblings. Reji is ready for the beach in his Hawaiian Camp Shirt from BaxterBoo. He is so handsome and the envy of the neighborhood! Jackpot is 2 year old Chihuahua. He would never wear any type of clothing other than his harness. 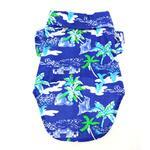 Until......we got him the Hawaiian Camp Shirt - Ocean Blue and Palms. He loves it. Posted On 05/11/18 by carol w from , Yes, carol w recommends this product! Posted On 08/14/17 by Russel N from San Marcos, CA Yes, Russel N recommends this product! Posted On 07/30/17 by Sarah from , Yes, Sarah recommends this product! Posted On 07/09/17 by Karen T from , UT Yes, Karen T recommends this product! This is so cute. It is well made. My little one looks like she is ready for a Hawaiian cruise. Love these Hawaiian shirts. They are well made and very cute. You can't go wrong with any of the Baxter Boo items! The description of the size is wrong on the website, so when I got the shirt it was too small. I was very disappointed. Posted On 03/21/17 by Sheila H from Dalton, GA Yes, Sheila H recommends this product! Posted On 03/16/17 by Bruce L from Sarasota, FL Yes, Bruce L recommends this product! MY YORKIE BASIL LOOKS GREAT IN HIS NEW SHIRT! Posted On 03/15/17 by Barbara S from Powell, TN Yes, Barbara S recommends this product! This shirt looks awesome on my 6 month old Golden! Super, Super Cute. You little guy will love strutting his stuff in this.